Tyharo mein meethai bina kya maza…right? We all just wait for all these festivals to start so that we can just hogg all those amazing yummy sweets because why not! I know during the festival our health is the last thing we actually care for but tbh, it’s actually the main thing we should think about or else we won’t be able to enjoy festivals properly. 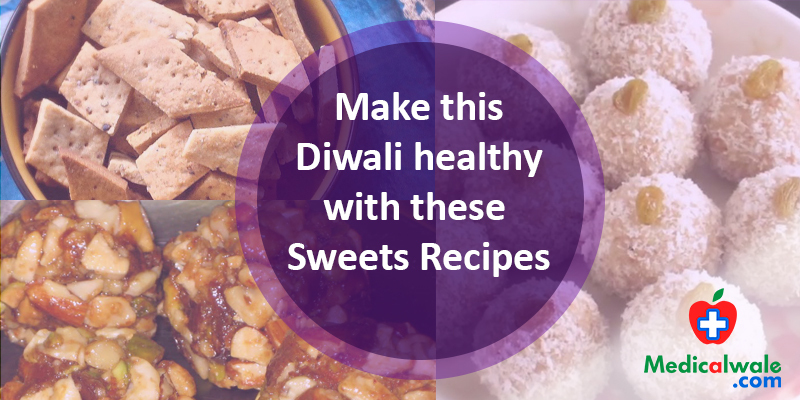 We are not asking you to skip or just avoid having those sweets; we are just providing you with the recipes that are healthy and delicious. So this Diwali, let’s start in a healthy way. Step 1- Grind dates in a blender for 4-5 pulses and keep it aside. Now, take finely chopped cashews, almonds, figs, pistachios, and raisins. Step 2- Heat ghee in a wok on low flame; add chopped dry fruits and sauté for 4-5 mins. Add coarsely blended dates to it and give it a nice stir, mashing the dates as well. 2 minutes. Transfer the mixture to a large dish and make the ladoos. Store it in an airtight container. Step 1- In a deep pan, add milk, ghee, and sugar and cook on a low flame for 2-3 minutes or till the sugar dissolves. Sieve the whole wheat flour and salt through a sieve in a bowl. Step 2- Add the ‘milk, sugar, and ghee’ mixture to the wheat flour and knead soft dough. Roll out a portion of dough with a rolling pin and cut diamond shapes out of it. Step 3- Place them on a greased baking tray. Bake them in a pre-heated oven at 180°c for 8-10 minutes. Allow it to cool and enjoy while watching your favourite TV show. Step 1 - Take water in a pan, add jaggery to it and melt on a low flame. Once it melts completely, turn off the flame and let it cool. Filter it through a sieve in a bowl. Step 2 - Heat ghee in another heavy-bottomed non-stick pan on a low flame, add grated coconuts to it and sauté for about 2-3 minutes. Add jaggery syrup to the coconut and mix well, then add cardamom powder and give it a stir. Step 3 - Let it cook till the moisture evaporates and you see the jaggery-coconut mixture drying up. Turn off the flame and allow the mixture to cool. Grease your palms with half a tsp. of oil and roll the ladoos.